This is the second in a series of three articles on veld improvement for game. The article in the previous issue dealt with needs assessment. The focus in this article is on establishment, and the final article will cover management after establishment. All three facets require thorough attention for the best results. Seeding should be done early enough in the normal rain season to allow perennial grasses to mature for survival of the dry time of year. Seeding before the expected rains is risky, as there may not be sufficient soil moisture to make a favourable seedbed. Earlier-than-expected rains may cause germination but may not be enough to see the seedlings through to follow-up rain. Seeding of grasses is superficial. Therefore, cultivation for a favourable seedbed is essential. There must be sufficient moisture in the soil to avoid large clods being formed and yet not so much that tyres and implements pick up mud, and soil becomes excessively compacted. The soil should be analysed, as the opportunity to apply ameliorating fertiliser to correct serious faults may not return for many years. Nutrients for the establishment of planted grass pasture should also be applied in the first year. One can apply ameliorating fertiliser more easily and place it to best advantage if the soil is prepared as for crop land or pasture. This is not necessary if the aim is to reinforce existing veld, or may be impossible due to rocks and trees. If so, land preparation and seeding can be done in strips. In higher rainfall areas strips are made by drawing a single tine ripper minimum 300 mm deep but preferably at around 600 mm. In dry areas the basin plough or happloeg is widely used on sandy soils but will not be suitable on heavier soils, as the clay content causes the basin plough to smear the surface and cause a sealing effect. Strips should follow the contours. This slows run-off, water is trapped for the plants and silt is deposited to benefit future seed germination. In their first season the grasses must establish, flower and set seed before grazing occurs. This seed is for deposit in the soil’s seed bank and dissemination to the surrounding area, particularly important when planting strips. New growth is more attractive to animals than existing veld. If possible, fence off seeded areas. If access to grazing animals cannot be limited, it is essential to brush pack. At least half the material should be from thorn trees. The brush has to be packed at least 1 m wide and must be 500 mm to 1 m deep. Brush is usually effective for three years and so it can be rolled to cover ground adjacent to established strips and thus aid establishment from seed dropped during previous seasons. MayFord Seeds offers Biomosome® reclamation veld seed blends for degraded areas appropriate for the biomes of Southern Africa consisting of pioneer and sub-climax grasses. Many of the ingredients are veld harvested. The success of harvest of acceptable seed varies from time to time. Each batch is balanced to produce cover that will promote plant succession to climax veld, although species may differ. Consequently, the products are sold by the five biome group names. Biomosome® Wildlife mixtures are for enhancement of natural grazing. The range is also based on biome principles. The mixtures are comprised of sub-climax species that respond well to applied fertiliser and supplementary irrigation. Enhanced production from sub-climax species depends on these interventions being continuous. These grasses do well in most situations during the first year or two. Thereafter, they differentiate in response to variations in a seeded area. The Wildlife mixtures have components that adapt from full sun to shade and to differences in soil conditions, aspects, slope, etc. The climax that eventuates is quite different from climax in the usual sense of the term. Rather, it is the end result of a management scheme that depends on interventions, such as fertilisation, being continued in order to maintain higher-than-natural production. The final grass population will be dominated by sub-climax species, mostly from the seeding. The Wildlife range is typically used for high-value game in enclosed areas. Biomosome® Veld seed mixture planting suggestions Seed according to advertised rates under normal circumstances. The rate may be increased to compensate for less favourable conditions, such as steep gradient, seedbed problems and compromised seeding technique, but should never exceed double the rate, as this will result in excessive competition between establishing plants in sections where conditions are indeed favourable. The composition of the mix will shift to the detriment of species that are less robust at seedling stage. The seed is packed into bags of maximum 5 kg. Thoroughly mix the contents of each bag immediately before planting, as the components settle at different rates during handling and transport. 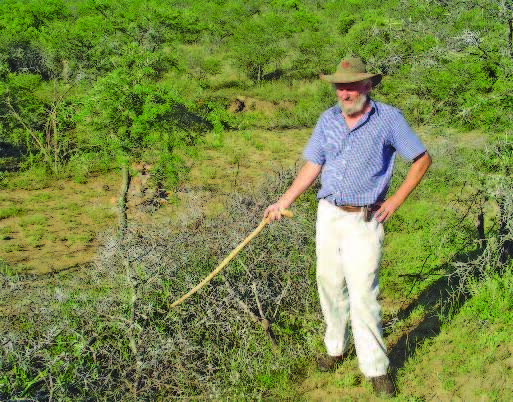 Seed of most veld-harvested species is characterised by the presence of straw. As this hinders the flow of seed in the planting process a spreading agent helps. Commonly used spreading agents are river sand, bran, finely sifted kraal manure and a mixture of agricultural lime and granular fertiliser. The quantity of spreading agent should be sufficient for smooth flow using the planting method selected. Generally, an equal volume of spreading agent is added to the volume of a bag of seed. Separate batches per bag of seeds should be blended with spreading agent to maintain the integrity of the composition of species. In larger quantities the components will shift due to differences in shape, texture, size and specific gravity. The seed should be blended with the spreading agent to achieve a uniform mix of seed in the material. The seed and spreading agent is generally broadcast manually on open fields. However, rotary spreaders have been used successfully. The spreading agent also has to be compatible with the working of a rotary spreader. A very light harrowing may be necessary to incorporate the seed into the top centimetre or two of soil but rolling is essential. If necessary, improvise but definitely roll. If a tractor is to be used for strip planting, a simple method for placing the seed on the loosened soil is application of the planting mixture by means of a 100 mm-diameter rainwater pipe mounted on a tractor, so that the seeds can be rolled into the soil by the rear wheels. More sophisticated implements to achieve superficial seed placement and rolling firmly can obviously be used if available. Under circumstances where tractors and implements cannot be used, the planting mixture is spread over hand-cultivated soil and trampled in by applying full body weight. With strip planting calibrate by firstly calculating the total metres of row per hectare to be planted. Divide this figure into the mass of seed per hectare plus the mass of spreading agent added to obtain the mass of planting mixture per metre of row.